The 1950s were a turning point in the history of Liverpool’s urban fabric. In fact, it marked a point in time just before some of the most wide-ranging changes the city had ever seen. A new book by Robert F. Edwards casts light on this era through a selection of photos under the banner Liverpool in the 1950s. The Second World War and the Blitzkrieg air raids of the early 1940s devastated the Liverpool landscape. Vast swathes of the town centre were flattened, buildings left standing were damaged beyond repair, and fires gutted what the bombs left behind. In the years following the War, Liverpool, like much of Europe, looked ahead to years of peace. There was a feeling that such a conflict must never happen again. But along the optimism, the middle of the 20th century brought to a head many threats which had been simmering just under the surface. Housing stock was poor in many neglected city centres and a ‘baby boom’ added to the burgeoning population. A housing crisis was the result, the response to which was a building bonanza. Not only housing, but offices and shops popped up like green shoots from the rubble of the shattered city in the 1950s and 1960s. 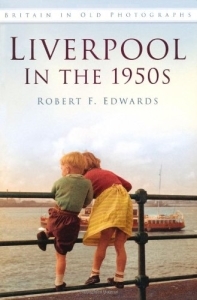 Robert F. Edwards new book, Liverpool in the 1950s, published by The History Press, focusses on the decade when the effects of the War were still keenly felt. Rationing was still in force, areas of the town centre remained pock-marked with bomb sites, and life was only just getting back to normal. The photographs – the main attraction in this ‘Britain in Old Photographs’ volume – capture Liverpool in its pre-Modernist, pre-towerblock, pre-St John’s Precinct era, and depicts street scenes of shiny black cars, children at the seaside, and lines of small, independent shops the like of which we see less often all the time. The Introduction sets the scene, and while it’s easy to see these books as nostalgia fests at least the author admits to such up front. To be fair, he’s selling himself short, as this book should appeal to a wider audience than those who remember it as part of their childhoods. The chapters take no fixed pattern: some are area-based (Bootle, Tuebrook, Toxteth) while others cover events or topics (Coronation Year, 1953, Liverpool City Police). The theme running through the book are the slice-of-life issues like holidays, school, horse and cart veg sellers, Aunt Sally (good for blowing bubbles, apparently! ), sugar soap and the paraffin-and-wax smell of Duffy’s store on Rose Vale. What’s obvious from this book are the different characters of the areas shown. The town centre would burst with new shops and department stores, while the slums came tumbling down. Tuebrook survived more or less intact, while West Derby was the setting for new council flats (e.g. Muirhead Avenue). Speke on the outskirts would host the grand experiments of new housing schemes. One thing’s for certain: Liverpool faced challenges, and whatever your views of its response, at least it rose to them, and this book captures Liverpool accurately in its moment of transition. However, the book isn’t without its faults. Though the selection of photos does the job, I noticed a few oddments: two photos of the Coronation parade were clearly taken seconds apart, duplicates down to the presence of the same horses in both images. In fact, a photo of an LOR station (Dingle, I think) is duplicated, posing as a burnt out pub called the Phoenix later in the book! Generally the captions are spot on, though the photo of The Matchworks in Speke is more accurately Mersey House, an admin building next door (OK, I’m being nit-picky now!). The book ends with a handful of photos of kids on holiday on both sides of the Mersey, and it’s here that the author indulges himself in recalling memories (and a photo) from his own childhood. There’s talk of beaches, ice cream and jam butty picnics. This will appeal most to those who were there too, but doesn’t detract too much from the enjoyment of the book if you weren’t. There were two photos which intrigued me most. First was that of a ‘Play Street’ – a road where cars were banned during daylight hours to let children play. This kind of scheme is seeing a resurgence in towns across England, but it turns out not to be a new invention! The second was of the foundation excavations at the junction of Lord Street and Paradise Street. The caption innocently points out “timbers from an old footbridge”. I’ve seen this mentioned off-hand a few times, but it’s worth noting that the Pool once flowed along the route of Paradise Street, so these could be significant archaeological remains (speak up in the comments if you know more about this). The book is another in The History Press’ photo books, of which several have been published on Liverpool. As a source of images from a crucial time in the city’s history it succeeds, and despite a few odd errors it’s probably one worth adding to your bookshelf, if you like your photo collections. The book is available now from The History Press, Amazon, and the usual other retailers. If you buy from Amazon via by clicking on the cover to the left, then you’re helping support this site through their affiliate scheme. 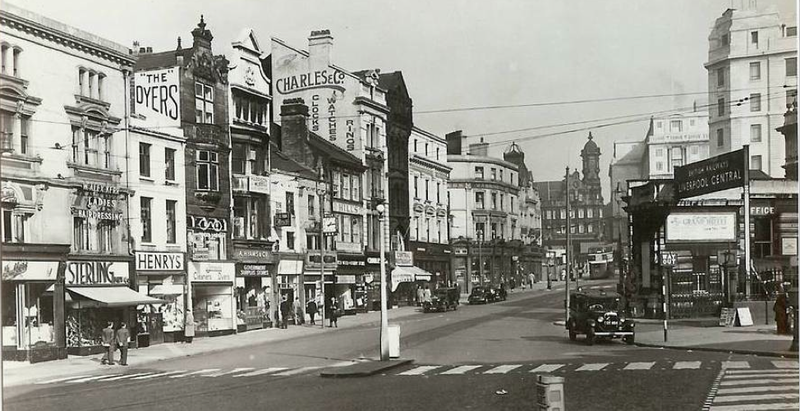 Looking for old photographs of peach St Liverpool from the forties or fifties. I’m not sure whether it’s the right era or not, but there are three photos mentioning Peach Street on the Liverpool Picturebook website: https://www.liverpoolpicturebook.com/p/l6-l7.html?m=1 (use your browser’s search function to find the words in that page). Some of them seem to have Peach Street in the background rather than front and centre, but hopefully it’s a start for what you’re looking for.